It is rather a peculiar sight to behold… three strapping, tattooed and bearded guys hop out of the back of a dusty bakkie at the edge of a forest bearing wicker baskets. If you live in Franschhoek, this sight may not be peculiar at all, in fact, rather common. 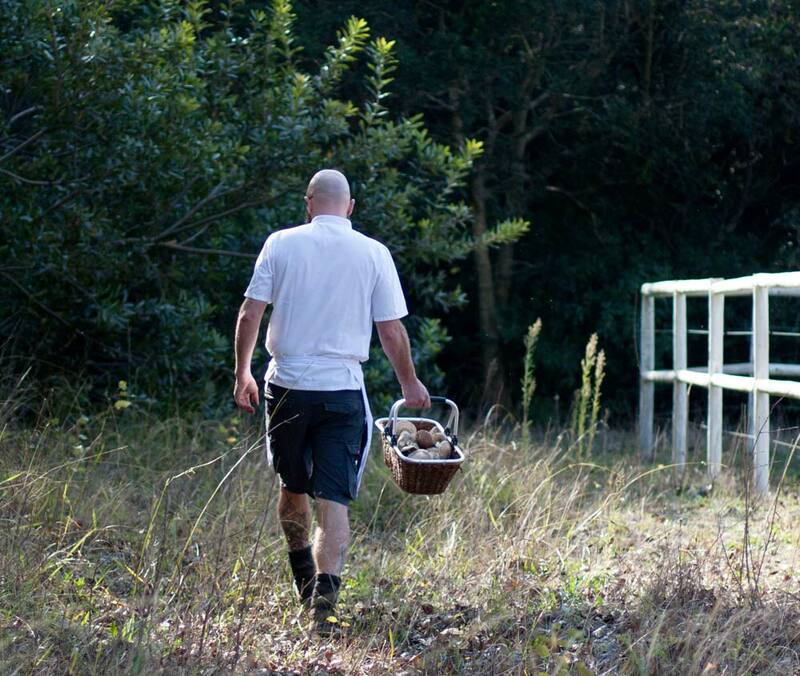 This is Chef Chris Erasmus and his team doing one of their favourite things – foraging for edible wild mushrooms. The forests at the foot of the mountains surrounding Franschhoek are the ‘outdoor food market’ for these guys, and it doesn’t get more organic, forest-to- table or sustainable than this. Not even close. Chris allowed us to tag along on one of these daily forages and our appreciation of the humble fungi quite literally… mushroomed. Now that’s not just a silly pun, I say this because the term used in this context is used to describe something that expands or grows rapidly, and I never really appreciated just how quickly they grow until listening to Chris. Apparently, on a day deep in the forest when nature stills, if you listen closely, you can hear the fallen leaves on the bed of the forest floor rustle as new mushrooms grow underneath. Mushrooms are known as fast growing organisms and they live up to their name, appearing overnight. What you may not know though is that the part you see above ground is able to grow so quickly because the rest of it is underground. Also, a mushroom is made up of a very loose network of fibres and not much more, hence its ability to reproduce so quickly. This also means that their nutritional value, in terms of proteins, carbohydrates and fats is very low, in fact nonexistent. But that doesn’t make us love them any less. They add texture, flavour and umaminess to a variety of dishes across many types of cuisines. 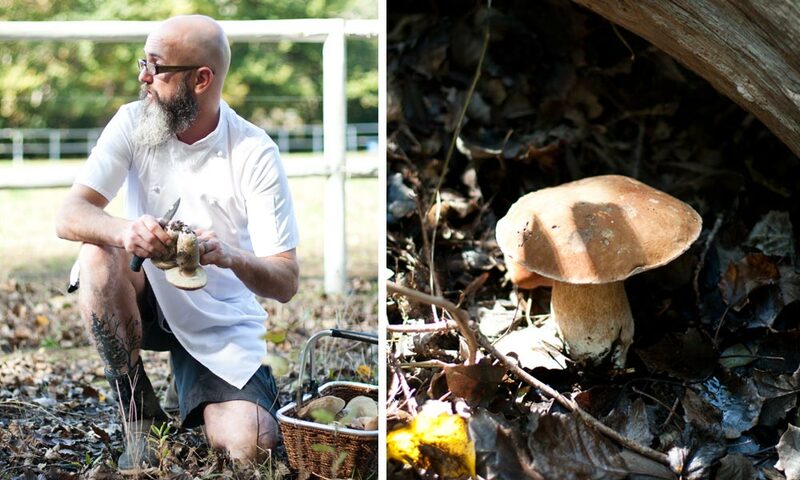 For Chris and his team at Foliage restaurant in Franschhoek, mushroom foraging, and in fact foraging for other ingredients in the forest, is the basis of what they do. 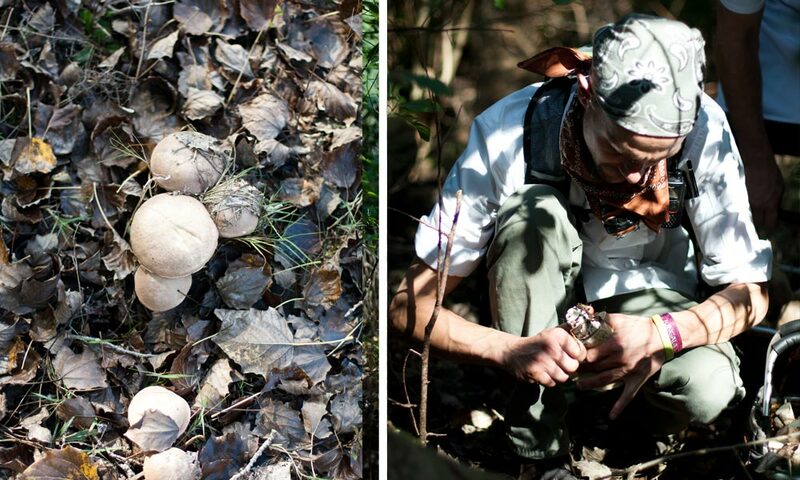 It’s what Chris is passionate about and this passion is evident when they are in their happy place – the forest. 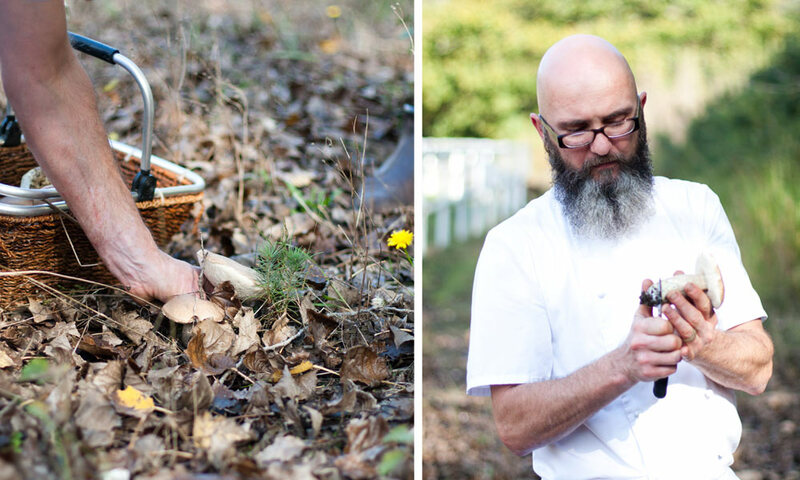 I asked Chris what he loves so much about mushrooms and his answer was true to form of his mischievous nature “My morning rush hour traffic is in the forest with my own thoughts, hunting cunning little fungi – what’s not to like? It’s like playing hide and seek!” What’s not to like indeed. 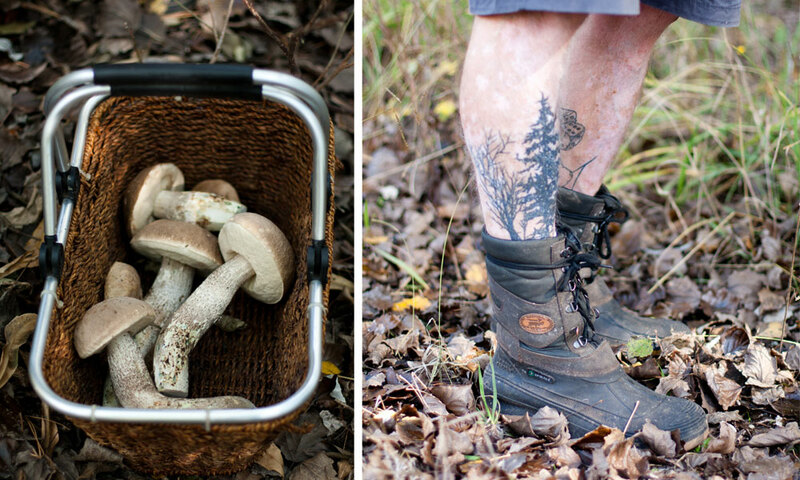 Mushroom foraging is not for the uneducated however, and requires not only a deep knowledge of these capped culinary delights, but also respect. Mushrooms that may look extremely similar can, in fact, be very different and very dangerous, with small amounts of the wrong ones able to cause serious harm. This is not a day’s outing for the uninitiated. The Foliage team are currently collecting Saffron Milk Caps, Birch Boletes, Penny Buns, Suillus Boletes, Slippery Jacks and Red Cracked Boletes. To the untrained eye they can be hard to spot as we found, but as Chris told us, “Your eyes do train after a while, but different mushrooms are connected to different trees, so you learn your trees first, then you build up your own secret spots!” Porcinis like Oak trees, Milk Caps favour Pine and Birch Boletes make their appearance under Birch and Poplar trees. At first glance it seems that the wicker baskets the team are toting are just a part of the look – a way to evoke that a country rustic feel. But really, these baskets are used for good reason and not just for aesthetic appeal. By design, the woven baskets have natural holes, and this allows for spores to drop out onto the path walked, allowing for the mushrooms to re-grow. Perhaps it’s just coincidental then that they fit the vibe perfectly. As Chris pulls a beautiful Bolete from the forest floor he gently shaves the bottom of the stalk, removing any attached soil. The soil can be hard to remove from the underside of the mushroom if it falls in and also some varieties have spores on the stalks, so this action also allows spores to spread and re-grow. Mid-discussion we hear an excited whoop from across the forest, and on catching up with team member Nick, he produces an astonishingly large and beautiful Bolete – the find of the day for sure which takes pride of place in his basket. As I followed the team around the forest I ardently searched the forest floor, looking to spot the creamy caps hiding in the shadows. All the while trying not to twist my ankle on the uneven forest terrain and keeping an eyeball out for wily forest creatures. I suspect my mushroom hunting days are limited; I’ll leave my enjoyment of the day’s find to the eating! Back at Foliage Chris whips up a dish that celebrates the humble mushroom and showcases its beautiful, meaty flavour. From the forest floor to the table at Foliage, this is as fresh as it gets. As I enjoy the dish I feel quite privileged to have been privy to a little bit of what Chris and his team do every day and to have experienced my own little bit of mushroom magic. Chris prepared this dish of BBQ Beef Neck With Mushroom, Potato Ragout & Caper Purée with the mushrooms foraged with his team. 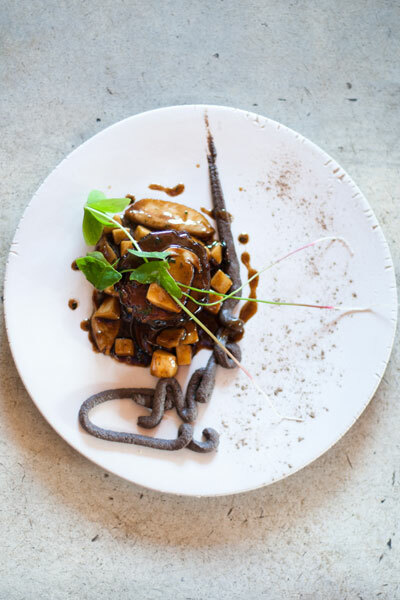 To taste the spectacular food Chris and his team cook up, visit Foliage Restaurant in Franschhoek; read our review HERE. 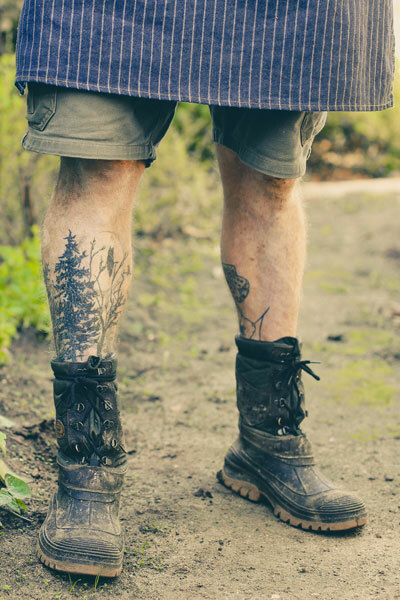 Check out Chris featured here in Cape Town Chefs and their Tattoos.